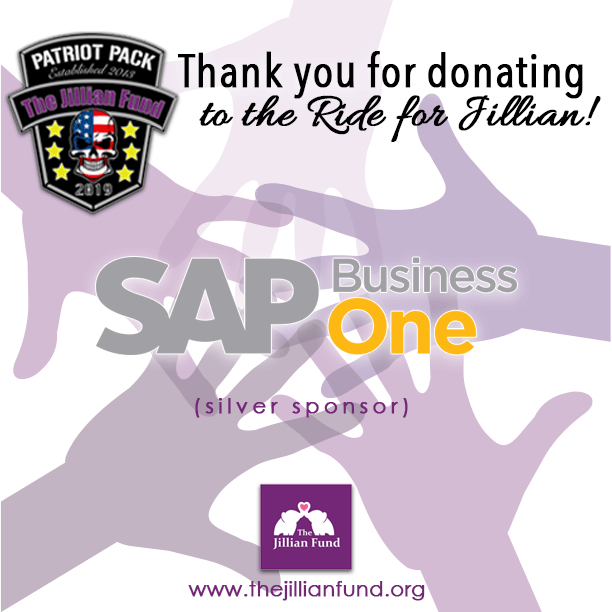 SAP Business One Sponsors The Ride For Jillian! | Industry Analysts, Inc.
SAP Business One has sponsored The Ride For Jillian! The annual ride to benefit The Jillian Fund begins at SAP Business One reseller All Covered/FORZA offices in Scottsdale AZ, then heads east towards Atlanta before heading north to Washington DC where riders will join Rolling Thunder, a million motorcycle run that honors our veterans and MIA/KIA Memorial Day weekend. THANK YOU GREATAMERICA FOR YOUR SUPPORT AND AMAZING DONATION!!! This entry was posted in All Covered, Jillian and tagged all covered, forza, SAP Business One, The Jillian Fund, The Ride for Jillian by andyslawetsky. Bookmark the permalink.